The gap between the Tulloch Bunkhouse meet and the dinner meet seemed unnaturally large so a day walk was a good way to keep the momentum going. I needn't have worried about how this would go down with club members and newbies: the promise of public transport options, dubious navigation and cake was irresistible for many, and 15 folk joined in on the walk. Most of us caught the train from Waverley to Tweedbank, the sunlight streaming in through the train windows forcing Alison to don her sunglasses early on. 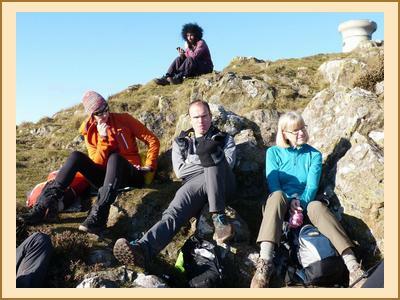 We picked up Alan H, Clare A and a couple of PNMs in the Borders and followed HorberryNav to the foot of the Eildon hills for the steep climb up a clarty path. We enjoyed sociable meals and ubiquitous mince pies and muffins on the sunny side of Eildon Mid Hill (422m) and I flew my kite in the little breeze there was there. We walked south to Eildon Wester Hill via the Little Hill (which has its very own contour line) and followed the St Cuthberts Way path back to Eildon Hill North, stopping again to soak in rays, cakes and play fetch with passing collie dogs. The descent wasn't quite as clarty but there was a split in the group near the bottom of the hill with some folk going through the trees to seek the Rhymer's Stone before rejoining the group in Melrose after a less inspiring section along the road. We made the train without too much bother after the return walk along the banks of the River Tweed, leaving Clare and Carolyn in the pub en route. 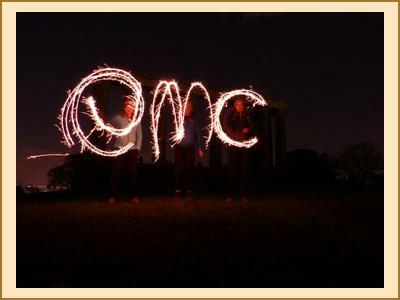 Katrina, Emma C and I waggled some sparklers around on Calton Hill once we'd returned to Edinburgh. A very sociable day, led at a leisurely pace by no-one in particular. Expect these to show up on the Meets Calendar in the future.